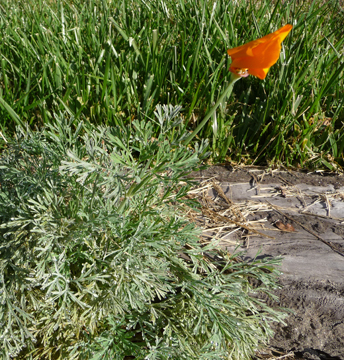 California Poppies bloom in March and April and make a joyfully colorful splash across yards, hills and mountains. They may be the true California gold. I was delighted and surprised to see a clump of them blooming in the yard in July when I moved in. By August, I was amazed to see them still blooming in spite of the heat. I've now run out of words because they are still blooming in spite of a few frosty mornings and the recent drenching rains. This picture was taken this morning. They grow here too! And they're one of my favourite flowers. Lucky you to still have some blooming! I also really like poppies. Sometimes along the Virginia byways great masses of them will appear. They always make me want to stop and run through them. Thanks, Maureen ... I really like this blog.